A high resolution, low-noise scientific data acquisition system. The LIH 8+8 is a high resolution, low-noise scientific data acquisition system. It utilizes the latest USB 2.0 and high speed processing technologies. The LIH 8+8 provides expandability and versatility that will satisfy both current and future needs. With its USB 2.0 interface, the LIH 8+8 can easily be connected to a laptop computer without the need for a peripheral PCI card. The analog input and output channels are isolated from the digital lines that communicate with the computer. Each analog channel has it’s own separate ground patch and the digital section has a completely different ground. The result is complete isolation of the acquisition side from the computer side with full 16 bit capability and low noise. The LIH 8+8 system is comprised of a USB 2.0 computer interface and one or multiple analog rack units interconnected by CAT5 cables. The USB 2.0 provides superb performance, while the CAT5 cables allow multiple racks to be synchronised during data acquisition. A single external trigger is capable of starting multiple racks simultaneously. The number of racks supported by one computer is only limited by the number of USB connectors available in that computer. Multiple racks installed in the same computer or in separate computers can be synchronised. The LIH 8+8 provides eight analog differential inputs, four analog differential outputs via BNC connectors at the front panel. Sixteen digital inputs and sixteen digital outputs are provided on one connector at the rear panel. In parallel, 4 digital outputs and 4 digital inputs are provided via BNC connectors on the front panel. All channels are sampled synchronously. The LIH 8+8 has a sound generator built-in. A sound connector at the rear panel allows connection of an active speaker or a headset. The LIH 8+8 features cophasic acquisition of the two most relevant signals; ex. the current and voltage trace of the amplifier. The acquisition board samples these two AD-converters in parallel with no time delay. In the schematic below the two AD channels exhibiting cophasic acquisition are AD-0 and AD-1. The eight analog differential input channels are separated into two banks of four. One bank is comprised of AD channels 0,2,4 and 6 and the other bank is comprised of AD channels 1,3,5 and 7. Each bank is multiplexed into one 16-bit 200 kHz A/D converter. Both A/D converters sample simultaneously and synchronously at the maximum conversion rate resulting in a total throughput of 400 kHz. This unique arrangement allows pairs of channels to be digitized without phase-shift (ex; AD-0 & AD-1). In other words, there is no time delay between two DA-channels firing and the time of acquisition of two cophasic AD-channels. If the bandwidth of the experiment calls for lower sampling rates, the interface adjusts the rate accordingly. Time delays of 5 µs per pair of AD-channels occur if there is acquisition from more than 2 AD-channels. 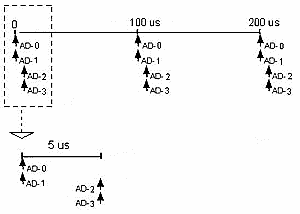 This is illustrated in the schematic below as the slight separation between the sampling of the pair AD-0 and AD-1 and the sampling of the pair AD-2 and AD-3 and is shown in the insert. Schematic illustrating a sampling rate of every 100ms (10KHz). The slight time delay between the sampling of pair AD-0 & AD-1 with pair AD-2 & AD-3 is 5ms (shown above). Four of the sixteen digital inputs can be accessed on the front panel via BNC connectors. The pin configurations are illustrated in the schematic. Four of the sixteen digital outputs can be accessed on the front panel via BNC connectors. The pin configurations are illustrated in the schematic.